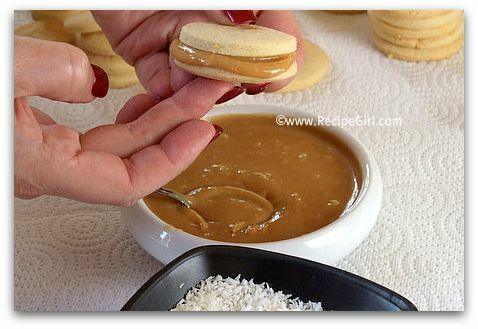 When I first began surfing food blogs back in 2007, the first recipe that caught me eye was for these delicious sandwich cookies that had caramel oozing out the sides: Alfajores. Here it is 2009, and I have finally- just now- gotten around to making them. Our neighborhood’s Gourmet Club had a Spanish-themed Paella dinner party last weekend, and I begged to contribute alfajores as a dessert choice. 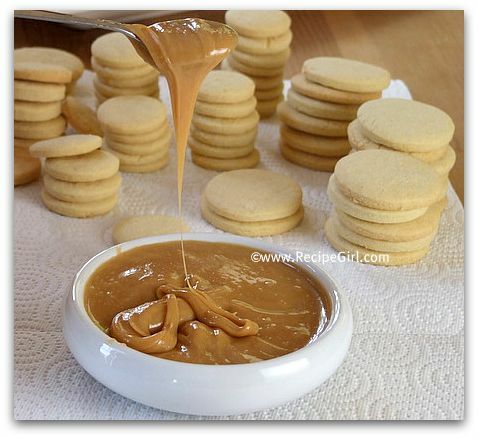 An alfajor consists of two sweet biscuits sandwiched together with dulce de leche (or jam) and sprinkled with powdered sugar. It’s a traditional cookie found in some regions in Spain and in countries of Latin America. 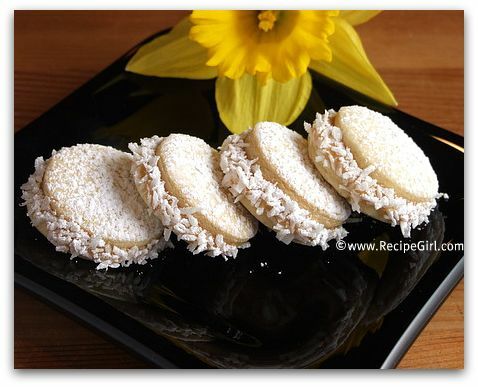 Our dinner party hostess grew up in Peru and is quite fond of the traditional alfajor. She was happy to learn that I was willing to make them. I scoured the blogaverse for the best recipe and settled on one found at La Vida en Buenos Aires. Mix the ‘biscuit’ dough by hand and then chill until slightly firm. Roll out the dough, and cut out rounds. (I used biscuit cutters- some 2-inch and some 1-inch). 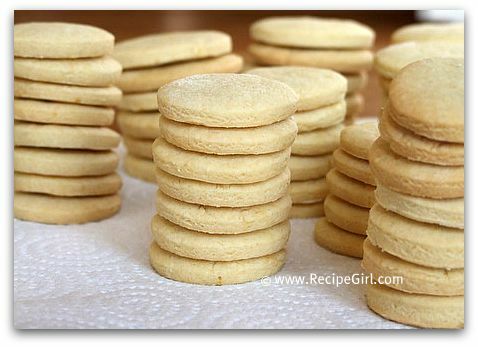 If you use a 2-inch cutter, you’ll get about 50 biscuits- enough for 25 sandwich cookies. Take some time to find good pairs that are like-sized and place them together. 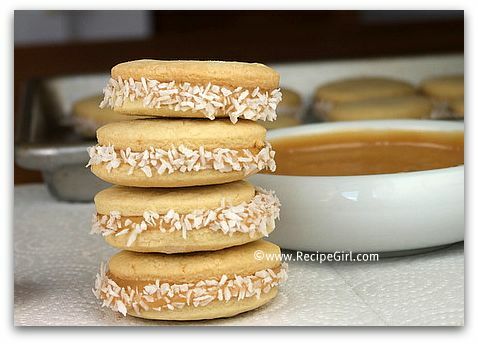 Set up an assembly line of biscuits, dulce de leche and grated coconut. 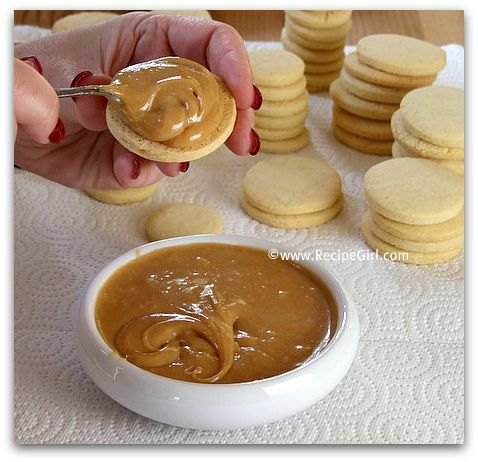 Make the dulce de leche homemade (instructions HERE). You can locate finely grated coconut in the bulk bins at Whole Foods for a cheap price. If you can only find the shredded sort, go ahead and grind it up in your food processor. You don’t want big shreds of coconut. Take some time to scoop up your dulce de leche and admire its gooeyness. Spoon a dollop of dulce onto the flat part of one cookie. 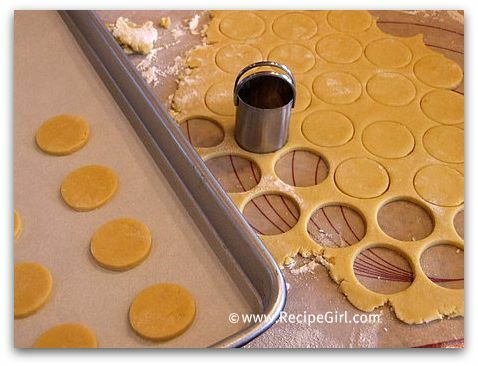 Place the flat part of the matching cookie pair on top and squeeze lightly together. 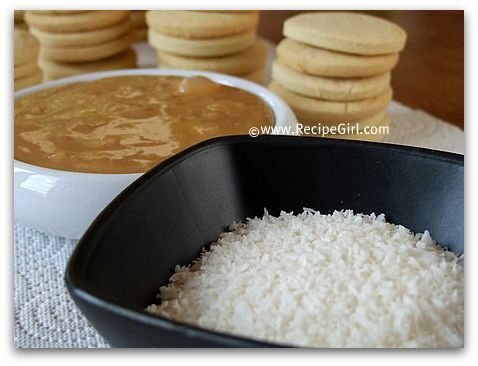 Roll edges in grated coconut, and place on rack to set. If it will be a while before serving (or if it’s a warm day), you may with to place them in the refrigerator to set. They’re good as is, but the classic alfajor is sprinkled with powdered sugar. You can do this just before serving to avoid the possibility of getting smudgy fingerprints on the cookies. I made some small ones that were a nice little treat for us to keep at home! The larger sized ones were brought to the dinner party, and they were served with Lucuma ice cream that they hostess had made. Lucuma is a fruit that is native to Peru and it is rarely seen in the United States. Since the fruit cannot be brought to the US on the airplane, our hostess brought back Lucuma powder to make the ice cream. 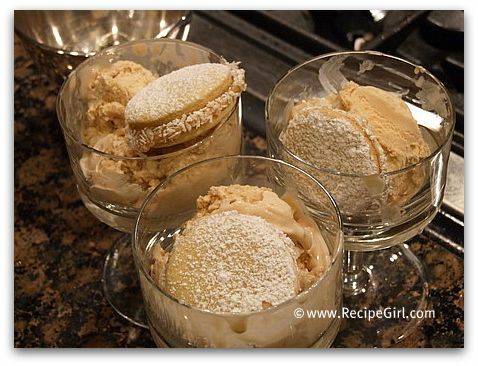 In Peru, Lucuma ice cream is more popular than chocolate and vanilla. I thought it was delicious. If I ever get myself to Peru, I’d love to try the real thing. The alfajores were a big hit at the party. They were a perfect garnish for ice cream, and the few that were left over were gone before the end of the night. Note: If you don’t like coconut, you can always leave it out… however, I’m one who doesn’t like coconut but loved it in these cookies. It doesn’t take on an overwhelming flavor at all. 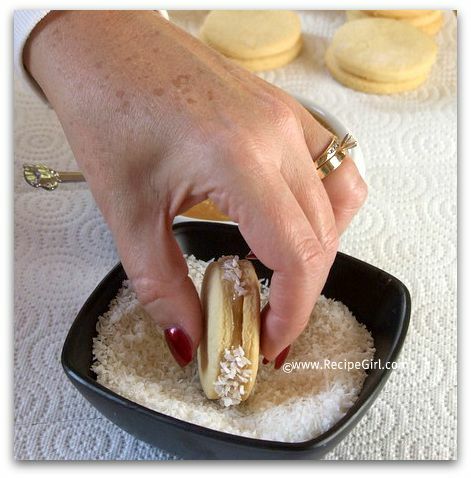 These are often called “alfajores de maizena”. The real and classic alfajor is like a cake, but tiny. They are made by some kind of biscuit, dulce de leche in the middle, and they are all covered by chocolatte. Look it up in Google Images, in Argentina are a lot of brands: Jorgito, Guaymayen, Havanna, Balcarse, Fantoche, Águila. And the list goes on and on. Its the favorite candy in Argentina. Can these cookies be made ahead & frozen? I want to add these to my Christmas cookie platters. They look delicious! I’d freeze them as cookies, then do the filling when you’re ready to serve them. Remember that South America steers clear of that sweetened coconut we typically use in the US. You will want to look for the finely chopped, unsweetened type that I can only ever find in bulk at stores with a large bulk food selection. My hubby hates coconut but as long as we use the South American kind, he’ll eat it. It has a drier appearance for the lack of corn syrup and it also doesn’t compete with flavor of the manjar/dulce de leche. yes, good point. I usually pick up the finely grated, unsweetened kind in the bins at Whole Foods. Don’t come to Peru to try Lúcuma fruit; it’s horrible! My husband and daughter LOVE the icecream made of it (I hate it!!) but even they hate the fruit.I’ve never see anyone eating just the fruit here, it’s always used to make something else with. But, do come to Peru for everything else it has to offer (but beware of thieves). I’ve been here for 14 1/2 years and I’m just into making alfajores and trying to get the best recipe. My kids adore them but I can see why they are relatively expensive to buy.